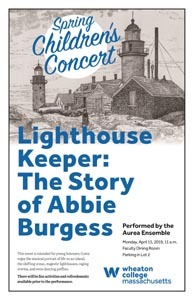 Bring your kids to hear the inspiring, true story of Abbie Burgess, famed New England 'lighthouse heroine', brought to life by narrator Jean Danton and string players from the Aurea Ensemble. This interactive event presents a musical portrait of life on a Maine island, including, the shifting ocean, majestic lighthouses, raging storms, and even dancing puffins. This event is intended for young listeners, ages 3-12.